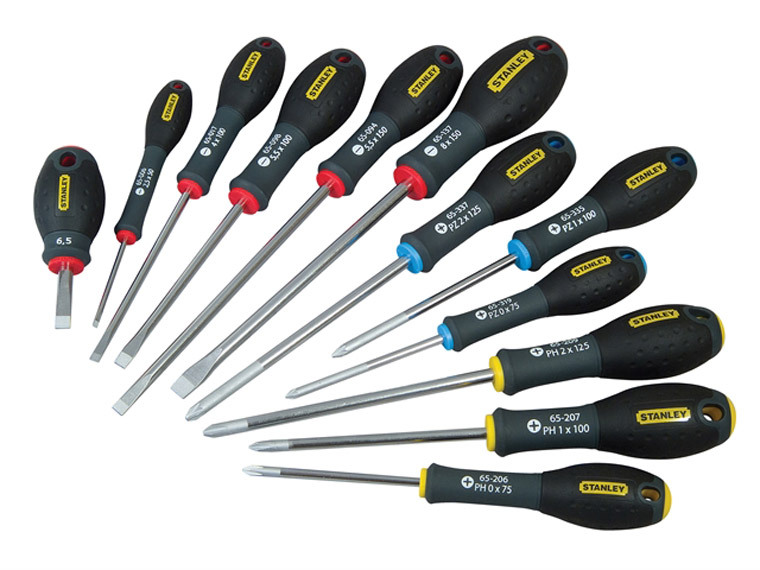 The Stanley FatMax Screwdriver sets have a chrome vanadium steel bar allows high torque and reduces the risk of tip breakage and the handle is moulded directly to shaft for a virtually unbreakable bond - gives long life and durability. Parallel: 2.5 x 50mm, 4.0 x 100mm, 5.5 x 150mm, 6.5 x 30mm (stubby). Flared: 5.5 x 100mm, 8.0 x 150mm. Phillips: PH0 x 75mm, PH1 x 100mm, PH2 x 125mm. Pozidriv: PZ0 x 75mm, PZ1 x 100mm, PZ2 x 125mm.